The power of a lens tell us its ability to converge or diverge a beam of light falling on it. The convex lens (A) with the short focal length converge the light rays by large angles and focus the rays close to the optical centre. Thus the lens with short focal length has a high converging power. 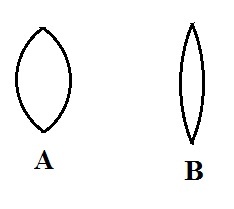 The other lens (B) with longer focal length converge the light rays by small angle and focus the rays far from the optical centre. This lens with larger focal length has a low converging power. Similarly for a concave lens, the shorter the focal length more is the diverging power of the lens. Thus power of a lens may be defined as the reciprocal of its focal length in metres. SI unit of power of a lens is dioptre. It is denoted by the symbol D.
Power of lens is said to be one dioptre if its focal length is 1m. 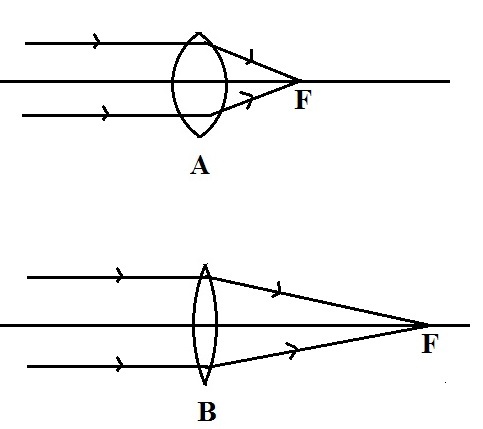 Convex lens has a positive power as the focal length of convex lens is positive. 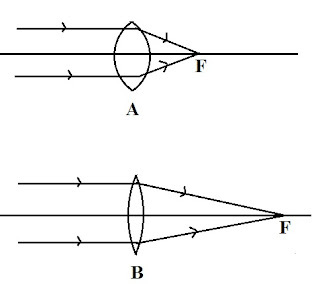 A concave lens has a negative power as the focal length of concave lens is negative. If lenses are combined then power of the combination is simply the algebraic sum of power of individual lenses.